Colorado ramifications for Polis' debt forgiveness philosophy? Colorado ramifications for Polis’ debt forgiveness philosophy? Home/Press Release/Colorado ramifications for Polis’ debt forgiveness philosophy? DENVER – Student loan “forgiveness” is again a top issue in national news and Governor-elect Jared Polis owes Coloradans an explanation about his support of canceling student debt and a clear plan as to how his previous stance will inform his proposals at the state level once he’s sworn into office. 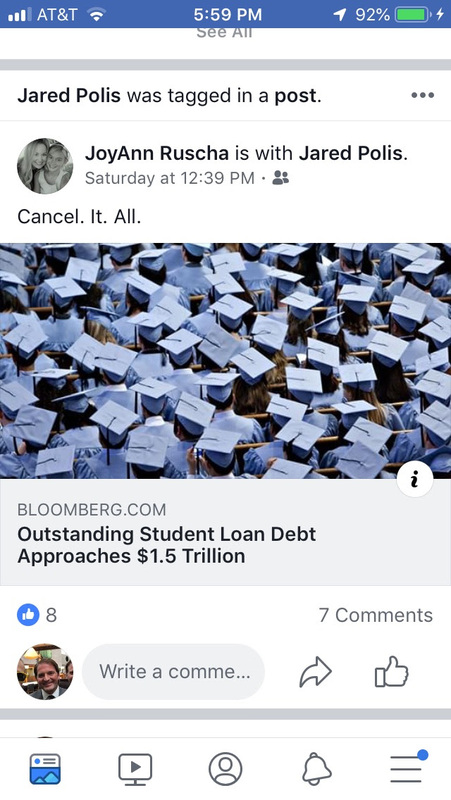 Congressman Jared Polis posted a video on Facebook just 6 months ago, while he was running for Colorado’s top spot, where he asked his social media followers to respond with what the cancellation of their student loans would mean to them. He did this while running a bill to redirect tax cuts toward student loan forgiveness. Thus far Polis has been unclear as to how he’s going to take this philosophy of debt cancellation to Colorado’s Capitol, but Coloradans deserve to know how this will affect them when he takes office.